It is sometimes difficult to tell if the resource you find is actually an original (primary) source or not. I have quite a few old Meiji period photos but as I find them on the net it is sometimes risky where I find them. Of course, reputable places such as galleries and museums are the best choice but they don’t always show the best photos. 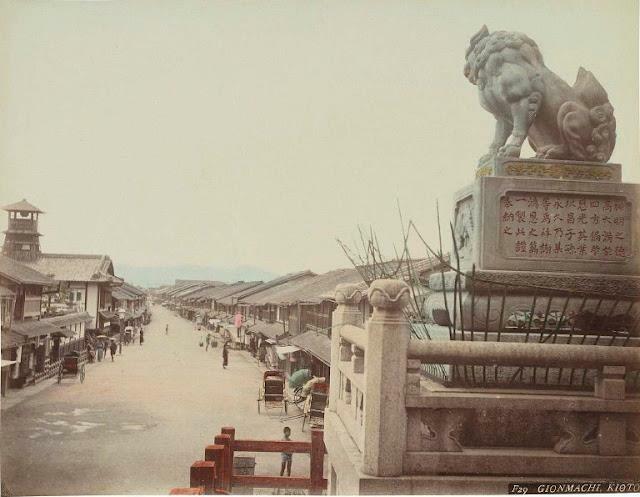 For example I just stumbled upon a colourised photo of Gion that is very different in quality to the one I have on file. This is the photo I have had on file for a while. 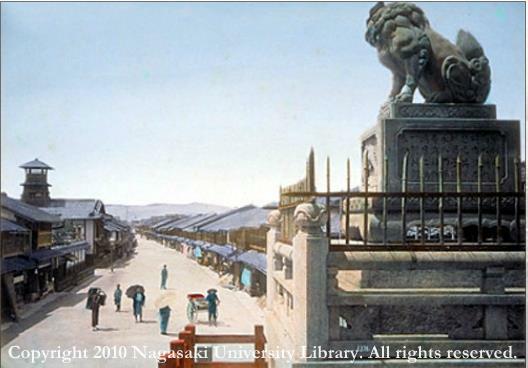 This is the full colour photo I just found through the Nagasaki University Library site. Although it appears to be the same photo, it is not. As a historian and photographer it leaves me with a few questions. Which one, or can we use both as a true source photo? I know the location is correct as I have been there, but could the colouring survived as show on the second photo? Has it been manipulated? Is the faded photo a truer indication of its age? It looks to be a slightly different photo but what is the age difference between the photos? The people on the street are different. The metal fence around the statue is also different. Is it the same photographer who might have returned to the same location a few years later? Anyone care to discuss any of these points? This is what I love about history and photography. Stories, adventure, discussions and learning. Previous Post Book and Journal lists updated. Next Post Famous or Infamous?